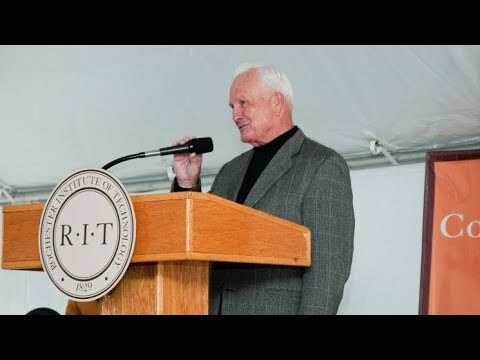 At age 80, E. Philip Saunders says he has no plans to retire and remains committed to helping RIT and his namesake college continue to grow. Serial entrepreneur and philanthropist E. Philip Saunders remains focused on growing local businesses, supporting higher education and giving back to the community. 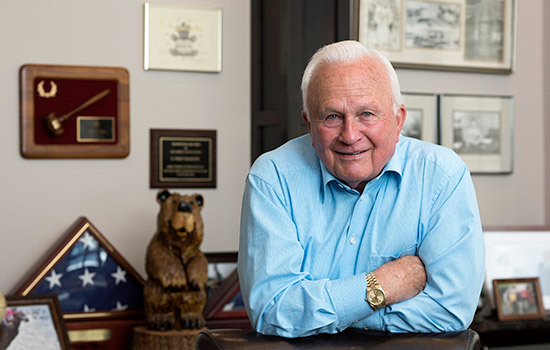 The president and CEO of Saunders Management Co., 80, is widely known around campus as the namesake of Saunders College of Business, to which he has contributed $18 million. The RIT trustee emeritus has been named 2017 Volunteer of the Year and will be awarded the tribute at the Presidents 'Alumni Ball during this year’s Brick City Homecoming & Family Weekend. It’s the latest RIT honor for Saunders, who received the Herbert W. Vanden Brul Entrepreneurial Award in 2005 and the Nathaniel Rochester Society award in 2011. Saunders could easily be included in the innovation category. In 1958, Saunders’ vision to create an empire of truck stops known today as the TravelCenters of America Inc. led to a lifetime of diversified interests in energy, auto and truck rental, recreation and tourism, packaged foods, property management, banking and business ventures. Saunders also enjoys healthy competition through physical challenges. At age 73, he took the Arctic plunge and paddled the Yukon in a 1,000-mile marathon to raise money for autism research. The “Sugar Creek Bears” came in at a very respectable fourth place out of nine teams. “There was no mutiny on board; things got a little disagreeable but we did it. The physical side you can train for, the mental side you can’t,” he said. His exercise routine includes walking on his 3,400-acre farm. “I like to watch things grow. I’m lucky to have had a great family (celebrating 61 years with his wife Carole)—and am happy with the way things turned out in my businesses, having a college named after me and knowing I continue to make a difference.